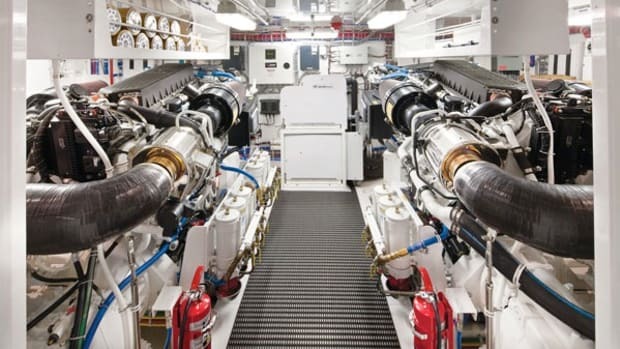 Whether you&apos;re looking for a trawler for cruising the coast or crossing an ocean, one area of the boat you&apos;ll certainly want to focus on during your search is the engine room. When we decided to purchase our first serious ocean-voyaging vessel, we knew our cruising would be different from our previous 20 years of boating, and our list of "must haves" took on a totally new dimension. Our plans included a 1,000-mile run from San Diego to Cabo San Lucas and then up to Alaska, and I knew we would need the safest and highest quality boat we could afford. Before we commenced our search for the perfect long-distance trawler, we developed a list of features that would help ensure safe and self-sufficient journeys. While Maria focused on the comfort aspects of life aboard, I zeroed in on the safety and reliability of the boat-and what better place to start than the engine room? I knew that being able to sustain life aboard for weeks at a time in remote areas of the world would require a significant amount of preventative maintenance, and most of that work would be performed in the engine room. Whether it be hourly engine room checks during a 30-hour nonstop passage or changing the main engine oil at a distant marina, it all happens in the Holy Place. Making sure everything in the engine room is properly designed and correctly configured is critical to making the time spent there as pleasant as possible. I say "as pleasant as possible" because even the best-designed engine room can be a tough place to work when you&apos;re getting bounced around in rough seas and the temperature is 110 degrees. Starting to get a better picture of how important the layout and functionality of the engine room are on a serious offshore vessel? 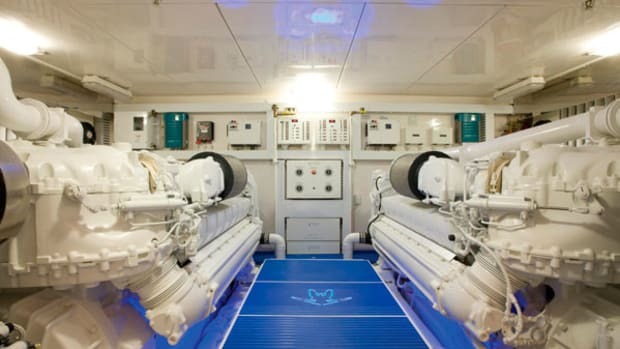 So, what does one look for in an engine room for an offshore-capable boat? We started with configuration and layout of all major systems, followed by visual aids like lighting and color. A well-configured engine room will be designed and built around the main propulsion system. On a single-engine trawler, you should have at least shoulder-width room 360 degrees around the engine. If the boat has twin engines, the same rule applies. Be leery of twin-engine boats where the outboard sides of the engines are not fully accessible. A leaking oil line that has only a few inches of clearance between the engine and side wall and requires you to crawl over the top of a hot running engine is not practical and can be outright dangerous, regardless of where you may be cruising. While standing room is preferred in any engine room, we recognize that even some midsize trawlers do not offer this luxury. The trick is to find an engine room with the amount of headroom that works for you. I&apos;m 5 foot 4, and our Nordhavn 40 works fine for me, with its 5 feet of headroom and 360 degrees of shoulder-width space around the single main engine. With the main engine mounted on the centerline, our "wing" or get-home engine, designed for emergency use, is mounted aft on the starboard side. While starboard-side access to the wing engine is tighter than I prefer, I accepted this configuration because all major maintenance (oil fill and check, fuel and oil filter access) could be performed on the easily accessible port side. This configuration provided for installation of the generator, including a sound shield, on the aft port side. As with the wing engine, the builder assured us that all maintenance could be performed on the inboard side of the generator. 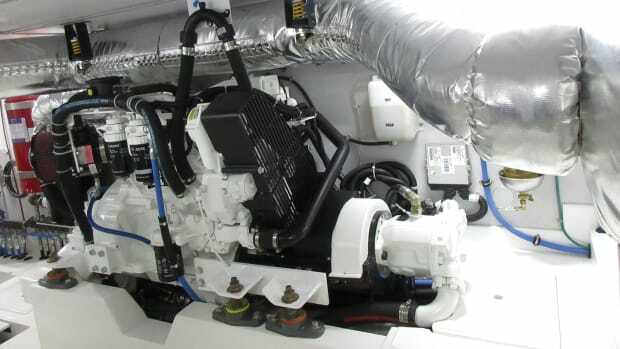 Fuel management is a serious operation on any long-distance voyage, and with a trawler crossing an ocean, or just making a trip from San Diego to Cabo San Lucas, it requires attention. It&apos;s critical that you be able to access fuel transfer valves, secondary filters, and the day tank used to calculate fuel burn. Ample side-wall and bulkhead space is required to mount the necessary hardware such that it is not in your way when transiting the area to perform checks and maintenance. Again, this is where the width of the engine room comes into play. In addition to what&apos;s mentioned above, there should be ample room to mount an automatic fire suppression system, stabilizer system reservoirs, and the oil change system. Easy access to the propeller shaft stuffing box is required to allow for adjustments while under way and maintenance when at the dock. While many people never look in the bilge, we insist on easy access to see what types of fluids may have found their way there. Keeping the bilge clean is another maintenance task that&apos;s easier to perform when there is room to move around. Temperature control is another area of consideration. Even with properly designed cooling and exhaust systems in place, the temperature in an engine room can run around 110 degrees, making time spent there uncomfortable at best. You don&apos;t want to be crawling around in a tight engine room in those temperatures. I recommend white, nonskid flooring and bright, 110-volt lighting. Being able to see and track where leaks originated from is a lot easier against a white background, and this helps reduce troubleshooting time. It&apos;s also important to have deep and secure shelving so you have a place to store spare fluids and tools without them shifting around. So, as you can see, there are many things to think about when it comes to an engine room. Hopefully, you will find one that fits your cruising needs.